It is from this exact spot that Thomas Cole painted his famous Lake With Dead Trees, and Jasper Cropsey created his beautiful sunset scene. 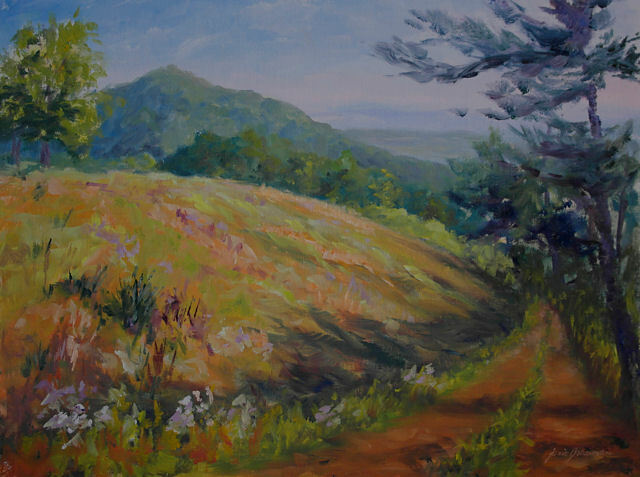 In fact, it is one of the sites along the “Hudson River School Art Trail”. I love returning to this location at all times of day and under different atmospheric conditions. Today I was drawn here by the strong cloud formations. It’s a very cool-toned landscape in the spring and summer, so I selected a spot with some warm foreground colors, and threw some of that warmth into the sky as well. This was at least the third time I’ve painted the home of Hudson River School artist, Thomas Cole. There’s something about the golden yellow glow and beautiful garden path that inspire me when I’m there. I did this painting for the “Postcard Show”, which is opening at the Thomas Cole House tomorrow. There was a pre-event today with about 60 of the 250 paintings displayed, and this one sold today! 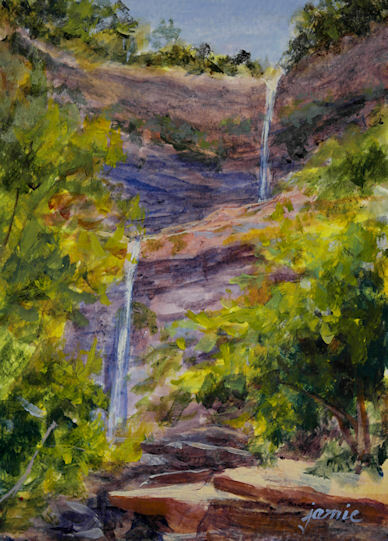 This painting was done on location at the tallest waterfall in New York State — Kaaterskill Falls. It is one of the sites made famous by the Hudson River School painters. 2×4″, oils on canvas panel. 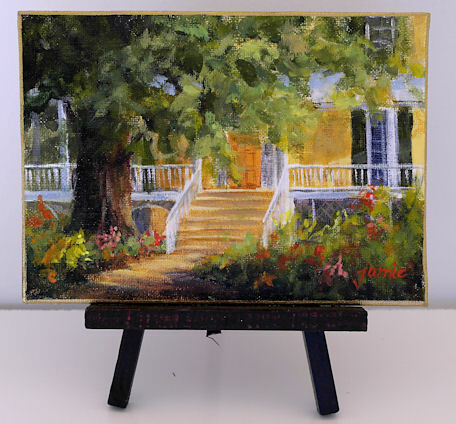 Price includes a mini easel. I have such a wonderful time painting these little miniatures! This one was painted on location at Olana, former home of Hudson River School painter Frederic Church. It was another beautiful day overlooking the mighty Hudson, which has inspired artists for generations. It was painted in a completely different way than the oil sketch from the same location, which I posted yesterday. There is no one “right way” to do things when it comes to painting! 16×20″ custom framed with an archival ivory mat and classic gold frame (included in price). Oils on sealed rag paper. Painting image size is 1/4 sheet (11×15″) in a 16×20 mat. It looks especially elegant with the mat and frame! $675.00 plus $40 shipping and insurance within the Continental United States. For local sales, shipping charge will be allocated to NYS Sales Tax. Please email me at JamieWG@aol.com for International purchases or with any questions. 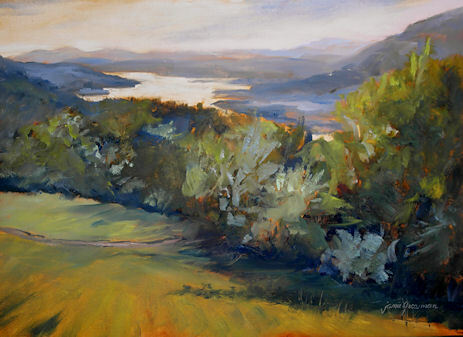 This painting was done on location overlooking Hudson River School artist Frederic Church’s estate, Olana. It is the famous Hudson River classic view from the property. 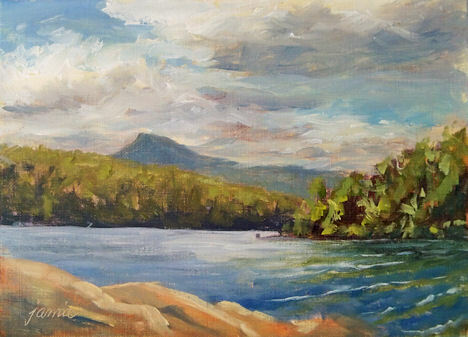 This started out as a monochromatic oil sketch on location, but as the it progressed, I was unable to avoid the temptation to start putting in color! Do you have a favorite painting by an Old Master? These miniature copies are done on a commission basis. Please contact me at JamieWG@aol.com if you’d like me to paint one for you. I am currently accepting holiday commissions. If you or your Special Someone have a favorite, this is the time to place your order for the holidays. 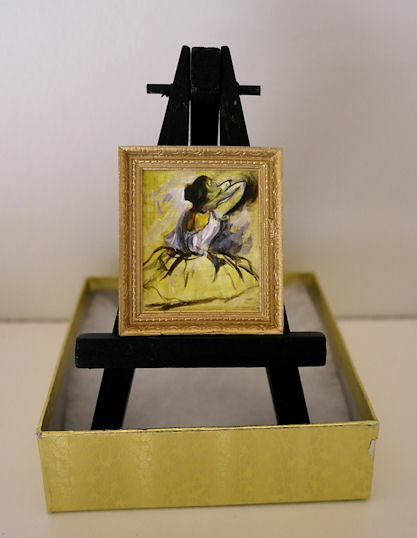 These miniatures are $150 including the frame and easel, plus $10 shipping and insurance. Collect a bunch of your favorite paintings for a beautiful table display! 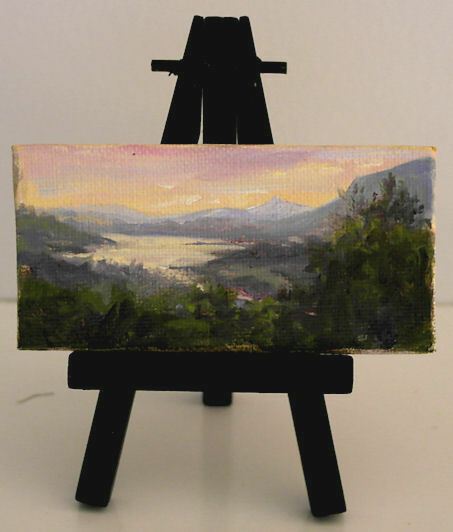 This is another of my “Jamie’s Jewels” miniatures fresh off the easel. 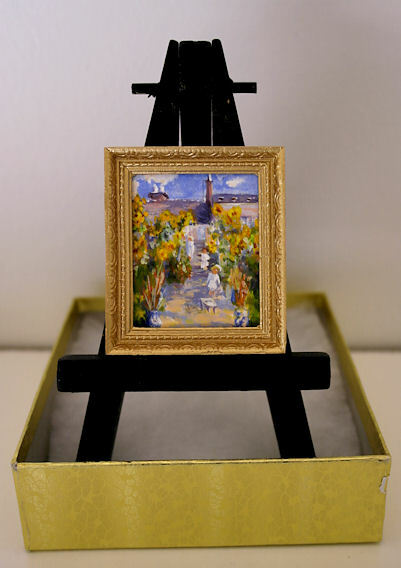 It is a tiny copy of Monet’s painting titled The Artist’s Garden at Vétheuil. This colorful gem was so much fun to paint! This painting was done on location last week at Hudson River School Painter Frederic Church’s estate, Olana, in Hudson NY. The field glows in the morning light with oranges, greens and purples as fall approaches. 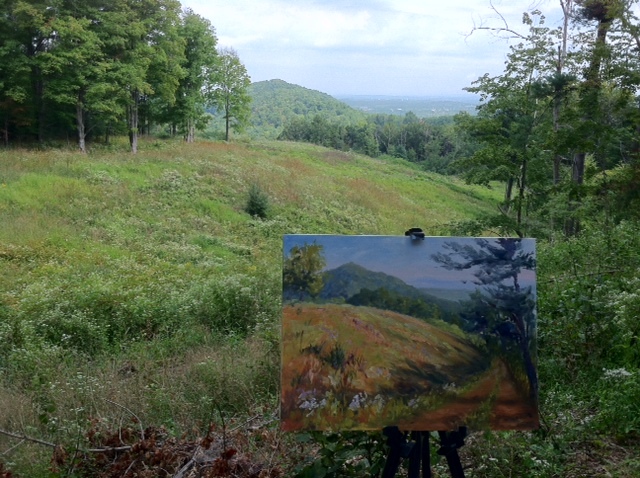 This is one of my favorite spots to paint at Olana. I was able to spend a few days there last week and enjoyed every second! $525.00 plus $20 shipping and insurance within the Continental United States. For local sales, shipping charge will be allocated to NYS Sales Tax. Please email me at JamieWG@aol.com for International purchases or with any questions. Last year, I did a series of small watercolor sketches from the same location, which are also still available for $100-$175 each depending on size (or make me an offer for the set of four). They are already archivally matted and with backing boards to pop into standard frames.